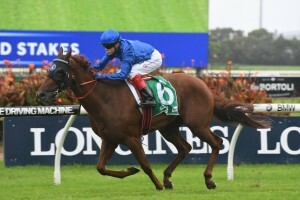 Raiment has delivered Godolphin an impressive black type win early on 2017 Golden Slipper Day; storming home to comfortably take out the Group 3 Birthday Card Stakes (1200m) by four lengths. Raiment flew the barriers and immediately took a positive position in transit alongside early leader Zestful; ensuring that the Birthday Card Stakes would be run at a genuine tempo. Experiencing a carefree run in transit albeit on heavy going, the Street Cry filly was offered a clear racing line upon arriving in the final straight and made the most of it; comfortably pulling away from her rivals to register the impressive win. Samantha worked to the line well to finish second, while Nancy also produced a smart turn of foot to round out the minors. Trainer John O’Shea was thrilled with Raiment’s performance to win the Birthday Card Stakes and believes that she will only improve for the run. “It was a really good team effort to get her here and it’s nice for Craig (Williams) too, because he’s been a big help for us in Melbourne,” O’Shea said after the race. “To come up here and make the weight at 53kgs and get a result like that is wonderful. O’Shea revealed that the Group 3 PJ Bell Stakes (1200m) on Day 1 of The Championships is the next target for Raiment, ahead of likely progression to other black type targets. Raiment has produced a number of impressive efforts through her nine-start career so far, but this afternoon’s win in the Birthday Card Stakes was her first at black type level. Raiment opened at Birthday Card Stakes odds of $3.30 on Wednesday, but drifted to a $5 quote by jump this afternoon.